'Blood, Looms and Blooms' - a wonderfully vivid body of electronic based songwriting that lends itself to the dark and gothic... Fourteen songs in total are like little, baroque, fairy tales composed in the darkest corners of her music box, featuring vocal performances from the likes of ex-Specials, Terry Hall, Martina Topley-Bird and Luca Santucci. Both formats are presented with striking sleeve art and gatefold sleeves. 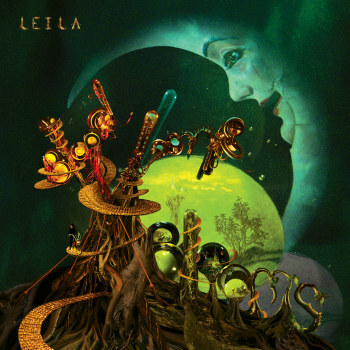 In the eight years since Leila Arab released her previous album Courtesy of Choice, the musical landscape from which her music was spawned has undergone a drastic metamorphosis. The trip-hop and drum `n' bass sounds which once underscored her sound have since lost their freshness, and pioneers of such genres have moved on to new and different things - Portishead's Third sounds nothing like what came before, and Roni Size has kept relatively quiet of late, though a handful of people seem to think he's the mystery man behind Burial. Leila, however, endured a lapse in her passion for music after the losses of both her mother and father. Yet her sadness didn't keep her away from music too long, as she toured as part of Björk's live ensemble and eventually found her way into the studio again, crafting the alluring and mischievous Blood Looms and Blooms. Leila, who counts not only Björk but Richard D. "Aphex Twin" James among her musical chums, is back in fine form on Blood Looms and Blooms, revisiting the atmospheric electronics of yore while remaining contemporary in her woven tapestry of samples and bubbly beats. Blood has a distinctly nocturnal feel, seemingly drawing inspiration from classic film scores. Yet there's a sinister, distorted feel to other tracks, like single "Mettle," which is driven by shivering guitars and deep bass. Leadoff track "Mollie" is the closest thing to classic trip-hop on this set, slowly building from a distorted, metronomic beat toward a sublime, haunting field of sonic bliss. The Specials' Terry Hall lends his vocals to a handful of tracks, including the playful waltz "Time to Blow," and closer "Why Should I? ", which also features the talents of one Martina Topley-Bird. Arab's sister Roya coos sweetly through the Andrew Bird vs. Tricky gypsy crash of "Daisies, Cats and Spacemen." "The Exotics" lives up to its name with sprightly electronic bursts and haunting vocals which seem to resemble a Theremin, and "Deflect," another Topley-Bird led number, buzzes and zooms in the album's sole example of a standout, commercially accessible single. In spite of having disappeared from recorded music for a while, Leila proves with Blood Looms and Blooms that she has, by no means, kept idle. On the contrary, this beautiful and peculiar album is as sonically engaging and hypnotic as she's ever sounded, and more eclectic than ever. Though the time leading up to this album may be marred by tragic losses, Leila has no doubt found a new and incredible muse, one that finds her making music as joyous and as inspired as ever.